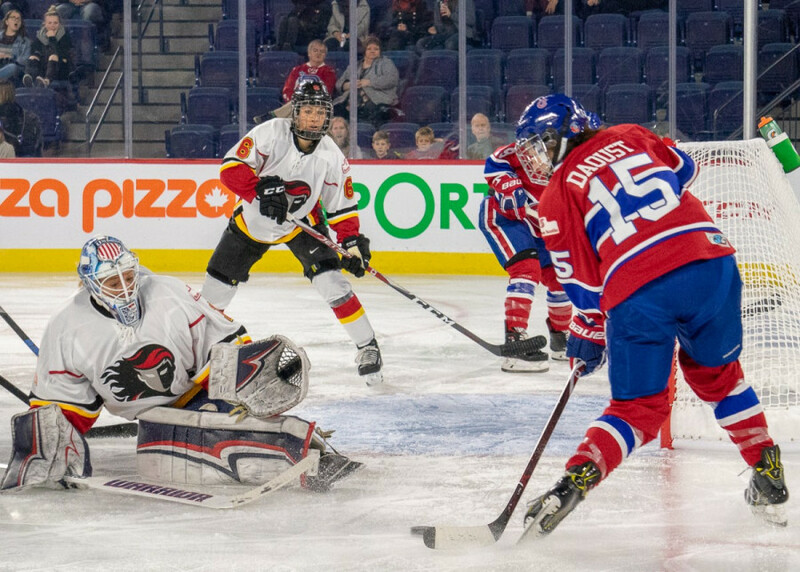 After beating out the Markham Thunder in game three of the Clarkson Cup semi final win the series, Les Canadiennes headed out to Toronto to take on the Calgary Inferno at Coca-Cola Coliseum for the Clarkson Cup final on Sunday afternoon. The game was broadcast across three mainstream media outlets, including the NHL Network and TVA Sports, in French. Sportsnet’s national broadcast featured an all-female panel, including the Toronto Furies’ Natalie Spooner. Going into the game, there were a few question marks on Les Canadiennes’ end, especially surrounding defender Erin Ambrose and captain Marie-Philip Poulin, both out with injuries. These two garnered some serious accolades at the CWHL awards on Friday night, with Ambrose winning defenceman of the year, and Poulin taking home the Angela James Bowl, for most points on the season, as well as The Jayna Hefford trophy for player-voted MVP, and the CWHL MVP title. Both were key players who could be seen as the difference makers in this game, should they take the ice on Sunday. As the two teams took the the ice for warm ups, Les Canadiennes fans were hopeful as both Poulin and Ambrose were seen skating and in uniform. Ambrose took part in line rushes while Poulin did not, looking “barely mobile” according to the Victory Press’ Kirsten Whelan. As the puck dropped in the first period, both teams looked ready to face their opponents head on. However, it quickly became clear that Les Canadiennes were outmatched in the first. It’s not that the Inferno had the better roster or the better strategy, but Les Canadiennes had one of the worst first periods they’d played all year, and were simply outplayed. Calgary’s Zoe Hickel opened scoring, putting one past Emerance Maschmeyer, just about halfway through the first. Up 1-0 over Les Canadiennes, the Inferno would double their lead before the end of the first, off of a shot by Halli Krzyzaniak, assisted by Blayre Turnbull. Les Canadiennes looked much more awake to start the second, with Ann-Sophie Bettez putting in a solid effort to shorten the Inferno lead just a few minutes in. Midway through the period, Brianna Decker answered back for the Inferno on a Montreal penalty kill. Bettez would tally her second as the period drew to the close, and the team finally looked as though they might have sparked enough momentum to carry them through to the end of the game. The third period was a very different story. Despite the strength Les Canadiennes seemed to have gathered towards the end of the second, the team now seemed almost defeated even before the game was over. With the score sitting at 3-2 Inferno, the game was still in reach for the Montreal side with 20 minutes left to at least even the score and bring it to overtime. But a disallowed goal for interference to start the third seemed to be the nail in the coffin for Les Canadiennes. The third period was Montreal trying to play catch up, and things just didn’t seem to connect for them. One more goal from Zoe Hickel and an empty netter towards the end sealed the deal on the Inferno’s Clarkson Cup win. Les Canadiennes and their fans could ask themselves many things. What if they had their league-MVP 50 point scoring captain? What if that goal hadn’t been called back? But frankly, none of these things would have really mattered, because they didn’t start strong and they didn’t play a full 60 minutes. Calgary’s Zoe Hickel and Kacey Bellamy were the game’s first and third star, while Ann-Sophie Bettez took second star. The Inferno’s Brianna Decker was presented with the game MVP. While the Inferno head for the champagne, Les Canadiennes head back to the drawing board looking to come back even stronger next season. In the meantime, a number of Les Canadiennes’ still have a few good games left in them this year as national team players head out to the 2019 IIHF Women’s Hockey World Cup, which kicks off on Apr. 4 in Espoo, Finland.